Putting together a list of game tips that people can refer back to. If I think of any more – or anyone suggests any other tips – I’ll add them to this post. It is possible to embed the login credentials inside the shortcut used to start Guild Wars 2. This allows you to create multiple shortcuts, with each shortcut logging into a different game account (whereas the “remember my details” checkboxes in the launcher itself will only remember the most-recently used account details). Right-click the shortcut, and select “Properties”. To skip the launcher entirely (most commonly wanted for mumble), also add the option -nopatchui to the end of the target field. Duplicate that shortcut with an altered password and email option for each account you want to be able to launch directly. To access bug submission open Game Menu -> Support, then choose the bug tab (looks like a ladybug icon). Or, type /bug in the chat box and hit enter. “Show skill recharge” puts a timer overlay on a skill, showing the number of seconds until it’s ready to use again. As it gets close to ready, it shows fractions of a second. “Melee Range Assist” makes it so that you can’t run through your target. With this on, you can keep moving forward running into them without flying past them. If you’re bad at catching kiting targets in melee normally (like I am *lol*), this can help. If you’re getting nauseous, try turning off “Enable Camera Shake”, and/or turning down “Post Processing”. Worst case, run the game windowed and reduce the height of the window while keeping the same width (Field of View is not adjustable, but is auto-calculated based on the ratio between height to width so this can adjust it). PP adds bloom and blur to the visuals, which are known to be one of the triggers for motion sickness/simulation sickness. Camera shake affects things like stomps and other big effect stuff by causing the screen view to vibrate. The Field of View in GW2 is a bit marginal for people susceptible to motion-sickness from games. Nausea is often the result of getting visual information saying one thing while physical information says another (“I’m moving really fast/vibrating from vision” with “but I’m sitting still and doing nothing” from physical queues), resulting in the body’s automatic systems deciding that the conflict in information must be due to some toxin and trying to get rid of it. Some of the optimisations in the last 2 stress tests seem to have increased the tendency for GW2 to trigger nausea (for me anyway), so finding the right options to disable so that it behaves a little bit more like the BWEs may help. LOD Distance affects where things like grass/flowers “pop” into existence. If those are bugging you (I found it particularly a problem in the Sylvari city), try turning that up. For aimed skills (aoe, etc), clicking the skill key a second time will cast it where the mouse cursor currently is. It’s often faster than clicking the skill key once and then clicking with the mouse, and it gives better control over the skill than turning on fast-cast does. There is a clock that can be turned on, which is displayed in the mini-map area. This can be set to your machine’s local time, or the server time (which can be useful during events “finale start at 12:00…and the clock says that server time is currently 11:45”). The mini-map can be dragged up into the top right corner if you’d prefer it there (where the compass was in GW1). On the right side of the map is a bar that will fade in when you mouse over it, grab that and you can swap it’s position over. The events/hearts listing will adjust down to below the map when you do. The party interface and chat windows can also be swapped in position. Grab the top bar (I think it was) of the chat window and you’ll be able to drag it up. From reddit: party member’s heart progress is now shown under their level next to their portrait in the party window. Hovering the mouse over the heart will tell you the actual percentage of completion. To ping a spot on the minimap, hold the shift key and left-click the spot. To draw on the minimap, hold the shift key and then click and drag with left mouse button to draw. To set a personal marker on the map, hold the Alt key and left-click the spot. To put a link to something in chat, hold the CTRL key down and right-click the item (if I remember correctly) – this sends the link immediately. I think SHIFT-right click puts the link in the chat, but doesn’t send immediately. CTRL-left click or CTRL-T to call a target. Use T to select a called target. You can set up the “select nearest target = C” as a keybind if you’re used to using it in GW1 and would like to continue to have it available. You can set up “reverse direction = X” as a keybind if you’re used to using it in GW1 and would like to continue to have it available. You can set up “look behind = Z” as a keybind if you’re used to using it in GW1 and would like to continue to have it available. CTRL, ALT and SHIFT modifiers are available (I use CTRL-1 as an alternative to F1, because I have CTRL bound to a mouse thumb-button). In dark/black areas (for example, the dark rooms in the WvW or Lion’s Arch jumping puzzles), activating an aoe skill target but NOT actually casting the skill can be used to show the contours of the area – the targeting reticule conforms to the shape of the ground and makes it all matrix-y. Likewise, wielding a torch offhand helps a bit by lighting up the area around you (as does any bonfires/fire aoe/etc). Split stacks: ALT-leftclick-drag the stack to an empty bag slot to open the split dialog panel (note: may not work if ALT has been rebound in your keybindings). Right-clicking a collectable item in your bags gives you an option to send just that item to the bank collectables storage. Other people don’t get to see your drops. The Hero panel can be used to determine what weapons your profession can use. Go to the skill tab and look at the Weapon Skills section – you get a list of all weapons you can use and what their skills are both for main and off hand use (also showing your progress in unlocking them). If you create a character, and then later forget what options you picked, you can see them again from the “My Story” section of the Hero panel. You can turn off the display of helmets and shoulder armour in the Hero panel – there’s a tick-box in the equipment slot to turn these on/off. You can re-dye any item with any colour you have unlocked for that character at any time (no cost). Above the equipped items in the Hero panel is an eye-dropper. Clicking this takes you the dye panel. Right-clicking a colour from the dye panel will add it to a favourites bar at the top so that you can find it again more easily. To preview an item (armour/weapon), right-click the item and select the Preview option. Using waypoints in cities (once you’re in them) is free. If you die and don’t have enough money on you to res at a waypoint, the game will first try to take money from your storage. It’s worthwhile to keep a little bit of money tucked away in storage safely “just in case”. If you have no money on you, and no money in storage, you will be restricted to using only the “closest non-contested waypoint” for resurrection (which may in fact not be all that useful to you). At any time, you can use the Hero panel to travel to PvP and then to Lion’s Arch for free. H to open the Hero panel, select the crossed-swords icon and choose “Go to the Mists”. From there, run across to the other side and there is an Asura Gate to Lion’s Arch. (Note: if you get stuck dead somewhere with no money to res, you may be able to use this to get to somewhere safe). At Lion’s Arch, there is an Asura Gate to each of the different races’ starting cities. All Asura Gates are free to use, so you can jump to a different area to play with a friend/get other ranger pets/etc easily. Each gate has a pair of representatives of the race that the gate goes to standing on the ramp just before the gate, which can help to work out which one is which. Crafting stations now have access to your bank storage (all except the money portion). In the crafting window, there are 4 tabs – discover recipies, craft known recipies, access bank slots, and access bank collections. This also means that crafting stations in the world maps (e.g. At the town Claypool in Queensdale) provide access to your bank storage while you’re out in the world. The mini-map area zooms in/out if you use the mouse scroll wheel with the cursor over the map. You CAN select a waypoint directly from the mini-map to travel to it. The range indicator for skills that are OUT of range have a red bar displayed under the skill. When you get INTO range to use the skill, this bar vanishes completely. Daily achievements net a nice xp boost, and some good items. Mail in game is account wide. You cannot send mail to another character on your own account. For the DD/CE, the Golem Banker appears to be 1-per-character, while the Tome/Chalice/Mini Rytlock is 1-per-account. Likewise, the prepurchase bonus ring is 1-per-character. These are delivered in a mail. Titles in GW2 do not have a statistical benefit – they behave like the Cartographer titles in GW1 rather than like the Sunspear title in GW1. You can display a title by going to the achievements section of the Hero panel, and selecting a title you have unlocked in the top-left drop-down box on that panel. Being cosmetic only (“I achieved this!”), if you don’t like doing the things that earn that title you don’t have anything making you feel like you have to do them. Achievements and titles in GW2 are account-wide. Some parts can only be done using characters of specific classes (e.g. titles for killing blows with weapons are restricted to being worked on by classes that can wield those weapons). Gathering earns a good amount of experience. It also provides the materials for crafting (which also earns good experience), or something you can sell to other players on the trading post. Gathering tools need updating every 10 or so levels. Trying to gather higher quality materials with crappy tools results in you getting broken crap instead of useful materials. When your gathering tools runs out, you don’t auto-stop gathering the node. You’ll get soul-bound merch crap out of it for the gathers that you had no tools left for. When you complete a renown heart, you’ll get money mailed to you. Remember to collect it sometimes – particularly if you’re low and need to travel to a waypoint. All heart NPCs become Karma Vendors when you complete their heart. These have some items you can buy for Karma – but they ALSO allow you to sell crap out of your bags at any time. Having merchants in the world so you don’t have to go back to town is useful ;). There is a buy-back interface in all merchants, so if you accidentally sell something you didn’t intend to sell you can get it back (note: items don’t stay there forever though). Transmutation stones are available as rewards for map completion, some quests, and for gems. As well as combining appearance and power of two items, these can be used to transfer upgrades (runes/insignias/etc) from one item to another. 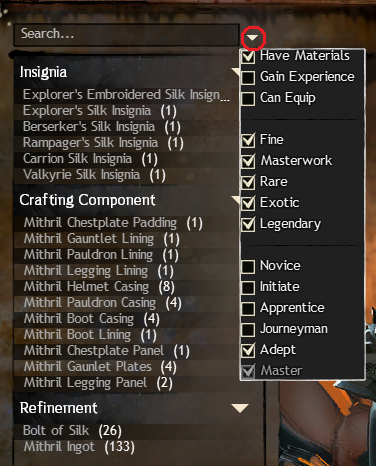 Crafting speeds up significantly if you have multiple items to craft – and you won’t be spending 3 hours waiting for one part to craft before starting on the next part like in Aion. Skill gains are fairly fast, the things you craft are always usable (not just junk to get levels), although you may find you need to craft for more than just one character to reach the next tier (i.e. 2 full sets of level 10 armour before you reach the point where you can make level 14 armour). Not a problem if you’re crafting for a friend, or an alt – and some will sell nicely on the trading post. “Critical success” results in greater xp/skill gain (and maybe a reduced materials usage – they spoke about this initially but I haven’t tested this part) for the craft rather than a different item being crafted, so no “dammit, it didn’t proc so I didn’t get what I was trying to craft” moments. Recipe discovery yields a big boost to craft level/xp. There is NO “critical failure”. You do not have any time where your materials just get wasted due to RNG. Levelling a craft from 1-400 is set to give 10 levels worth of experience to your character. It is possible to level all 8 disciplines on a single character (with only 2 being active at any one time) to level a character from level 2 to level 80. If you switch crafting disciplines, you do not lose your progress in the discipline you switched away from. Switching back costs 10 copper per level you have in the discipline you are switching to (max cost total of 40 silver to switch to a level 400 discipline). Extra Items can be sacrificed in the Mystic Forge at Lion’s Arch for (usually) a higher-quality/level item. If you like RNG in crafting, the Mystic Forge will be of interest. This forge is in Lion’s Arch in the centre of a circle with the bank on one side, the trading post on the other, the crafting stations above and the city Asura Gates below it. The Mystic Forge does not need a crafting discipline, nor needs to be levelled. Gift things to someone in mail, but treat it as a gift because there is no way to guarantee payment/etc. There is no trade window as existed in Guild Wars 1. You can’t safely use mail for “trading” because there is no form of COD or “can’t get the items without also submitting your payment”, but for giving people stuff/sharing stuff it works really well because you don’t need to be in the same place to send stuff. The trading post is global – all servers in the game use the same trading post. So the population size of your home world will not affect whether you’ll be able to find particular items on the trading post. You can put stuff up on the trading post from anywhere in the game, and can purchase stuff on the trading post from anywhere in the game – but you have to find a trading post NPC in order to collect any money earned/the items you bought. You can place requests to buy items for a specific price. Other players then have the option of selling direct to you for the asking price, or listing an item for sale at a higher price. The max sale-stack size is 250 items, but you can then add additional stacks to the trading post for the same value. i.e. to list 350 copper ore for sale, you add one sale for 250, then add a second for the other 100 with “add to my other sales”. People then buy the portion of the stack that they want – so you may sell that 350 copper ore as 40 pieces, then 5 pieces, then 250 pieces, then the other 5. There is no way to force people to buy only “the whole stack or none of it”, which means you can’t do something like “buy in a large quantity at once for a discount”. Trading post charges a listing fee up-front, then also subtracts a small percentage when the sale goes through for items being sold (i.e. when selling something for 50 silver, you pay a fee to list it, and will only get just under 49 silver from the trading post when it actually sells). Personally, I’m not that keen on the double-dipping of fees, though if it means that the listing fee itself is cheaper (for before you’ve earned the money from selling the item) it makes sense. The fees scale according to the value that you are selling an item for. Sending money in mail is limited to the total amount your character has earned in rewards/drops/etc. Money earned on the trading post does NOT contribute to this upper limit. This is an attempt to make it hard for gold sellers, but it may affect people in the first few weeks. Sending items is not limited – if you want to help someone buy something but can’t send them the money, buy the item and send them the item instead (assuming it’s not bind-on-aquire, but that seems to be limited to things like karma-bought items which you couldn’t help someone with anyway). I think this restriction lasts for the first month of an account before being lifted, and applies to depositing money to guild storage as well as mailed money. You can get the mail to fill in a person’s name by right-clicking on their portrait/name in friends list/name in guild list and selecting the send mail option. Keeping the mail window open, you can then right-click the item in your bags and select mail item to add it to the mail (useful if you’re having issues with dragging items with a mouse). The guild interface is accessed by the ‘G’ key. You can be a member of multiple guilds, but can only be actively representing one guild at any particular time. As you play the game, the guild you are representing will earn points to go towards providing buffs/upgrades for the faction of the guild on the world that is your home world. Guild membership is account-wide. All characters on the account are automatically a member of all guilds you are a member of. Each character on the account CAN be set to represent a different guild. Representation is remembered on a per-character basis. When you create a new character, you need to manually set them as representing a guild. They do not default to any representation (and thus earn no points by default). Guild Influence and Influence Upgrades are world-specific and shared for the guild. For this reason, it’ll be important that we do all start together on the same world. To create a guild yourself (for example, so you can have an additional 50 storage slots as per the Inventory post), you can choose to “Stand Down” at the bottom centre of the main guild panel, and then can create a new guild. Be careful not to double-click the Stand Down button, because it gets replaced with a “Leave Guild” button after clicking on it once making it easy to accidentally leave instead of just stopping representation for a moment. After creating the other guild, you can easily swap between them by clicking on the guild you want to represent on the left, and choosing the Represent option. You only see guild chat for the guild you are actively representing, regardless of how many guilds you are a member of. If you do create yourself a storage guild, remember that influence can be bought (and the costs recently reduced from 10g/1000 influence down to 2g/1000 influence). You also get a daily “attendance check” influence boost – if you change to representing your storage guild and then change back, you’ll get a small “I was logged in and representing” amount of influence for the storage guild that day. Tomes of Influence (from the CE/DD) give a 1-time-only 1,000 point influence boost to the guild you are currently representing on the world that is your current home world when used. ALL guild members are able to invite other people into the guild. In the Guild Roster tab (the 3-people head-and-shoulders icon), there is a text box with a “+” sign. Type their character/account name in the box, and hit the plus to send them a guild invite. At level 11, you can buy a book from the skill trainer for your profession to unlock the 1st 10 trait slots. At level 40, you can buy a book to unlock the 11-20 trait slots. Unless something has changed, this book will ALSO reset your trait point spending so that you can alter your build to take advantage of the extra area. At level 60, you can buy a book to unlock the 21-30 trait slots. Like the level 40 book, this should reset your trait points again. You gain trait points at 1 point per level from level 11 to level 80. You can change the major traits in the 10, 20 and 30 point slots at any time. To change the actual spending of points, you have to pay the skill trainer to reset them. You can spend points up to a trait skill slot by clicking on that slot (e.g. if you want to spend 10 points, you can do so by clicking on the 10-point major slot). Reduces the chance of error and having to reset them again from accidentally clicking the “plus” sign one time too many. The “Ruins of the Hall of Monuments” will be accessible through a Portal Stone that is put in a new character’s inventory. It is an account-bound stone. Double-clicking on the stone will take you to the HoM ruins, and double clicking them again will take you back to the world. If you did not get your portal stone on your first character, or have deleted the stone, you can get another stone from the Charr Karma Vendor in Hooligan’s Route in Lion’s Arch (Hooligans route is the top left corner of the Lion’s Arch map, in a cave) for free. The other way to regenerate a portal stone is to create a new character. Because these are account-bound, you can then transfer the stone between characters using your bank space. Support will NOT help you with creating new stones, since you can do it yourself. The HoM armour/weapon items are transmutation items (skins only) that can be applied to any existing item to give it the appearance of the HoM item without needing to use transmutation stones. You can generate these by talking to the ghost of Kimmes the Historian in the ruins of the hall. This is more my reminder check-list than tips, but I thought it might be useful to other people. Check weaponry. Look for cheap weapons on broker to unlock skills, or buy cheap white weapons from a weaponsmith npc, so that you can swap over to them easily when you’ve finished unlocking your current set of skills. Got any other tips? Please add them in the comments below!